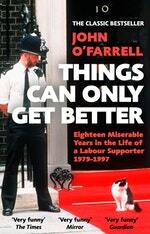 The hilarious account of eighteen miserable years in the life of a Labour supporter. Things Can Only Get Better is the personal account of a Labour supporter who survived eighteen miserable years of Conservative government. It is the heartbreaking and hilarious confessions of someone who has been actively involved in helping the Labour party lose elections at every level: school candidate: door-to-door canvasser: working for a Labour MP in the House of Commons; standing as a council candidate; and eventually writing jokes for a shadow cabinet minister. Along the way he slowly came to realise that Michael Foot would never be Prime Minister, that vegetable quiche was not as tasty as chicken tikki masala and that the nuclear arms race was never going to be stopped by face painting alone. Love Things Can Only Get Better? Subscribe to Read More to find out about similar books.